So yesterday and today our class was introduced to Twitter. I mean I know what Twitter is but I never actually used Twitter. To my surprise Twitter is actually very fun, and very interesting. So these past two days have been very interesting. We Tweeted about our novel the Count of Monte Cristo. It turned out to be a pretty fun activity. Everyone was talking at once and it was fast paced so I think I will be using Twitter more. The only downside about Twitter is that I’m new to all of this Tweeting and Hashtag stuff. I’m probably going to get laughed at or whatever for this but its ok I don’t really mind. Hopefully Twitter will be as equally addicting as Facebook so I’ll get the hang of it in no time. To be honest I didn’t really get the hang of Facebook either. Sad life. So once I get the hang of Twitter I think I’ll try and connect our blog site to Twitter and Facebook. If anyone would like to message us or help then please do so so we can improve our blog. Lately it has been quite difficult to relate our food blog to the stuff we learn about in class. Like relating food to Monte Cristo? Yeah its not gonna be very interesting I know. So if anyone would like to message us and give any of their own ideas on how to improve this blog then that would be greatly appreciated. Anyways, enough about school stuff. Let us talk about food. So every other Saturday night, I go to Krispy Kreme Doughnuts with my family. Let me just tell you that late night doughnuts and Trumoo chocolate milk or just coffee is absolutely amazing. 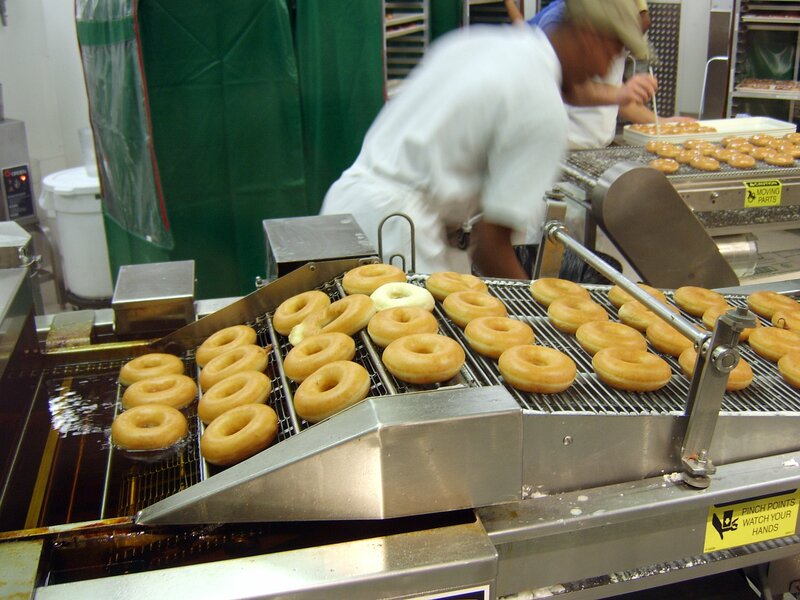 Walking into a Krispy Cream store and just seeing the doughnuts go down the ramps and the smell of the cream, it’s like you’re in heaven. Who doesn’t like doughnuts at night? Doughnuts at night are amazing! The smells, the sights, the taste….they are all amazing and just wonderful. The only thing i have to criticize about Krispy Kreme is the lines. Lines! Lines! Lines! Every Krispy Kreme I go to which is not a lot, I mainly go to the one at the Block, they all have lines. These lines are probably the most annoying lines ever. They always wrap around the shop and you spend an hour standing in a line, looking at doughnuts…to me it seems that the people in front of me always take forever and they can never decide what to order. Like seriously, please spend more time in front of me and just look at the doughnuts. It’s not like I’m hungry or anything. So a little advice for people when they go to a crowded place like Krispy Kreme, please try to decide what you would like before you reach the front of the line and annoy the people behind you. The worst was when one time I waited in line, and this couple took forever deciding what to get and then they decided oh they don’t want doughnuts anymore and then leave. -__- But the wait is all worth it when you get your doughnuts.